Have the Coolest Cirrus for You and Your Passengers This Summer! Enjoy cool, comfortable flights with one of our heat, glare and UV-blocking Jet Shades Solutions installed in your Cirrus aircraft. Jet Shades block heat, glare, solar energy and UV from entering the plane. And they look amazing on the ramp! Our premium package for Cirrus! This is the maximum Jet Shades package that will cool down your Cirrus flights, significantly increase the comfort of pilot and passenger, protect all on board from harmful UV radiation, reduce glare and pilot fatigue, prevent overheating on your tablet and phone, make your Cirrus aircraft a real head turner on the ramp! With this package installed in your Cirrus, you will want to fly your aircraft just because it is so nice inside. The Total Cirrus Solution Jet Shades insert easily into the side cockpit windows, upper windshield, the rear passenger windows, and rear storage skylight blocking heat and UV from the pilots, passengers, and storage areas. You will notice a significant difference as the amount of heat and solar energy entering the plane is greatly reduced. The package will also provide the maximum protection for your Cirrus aircraft interior from solar damage. If you already have the factory-tinted windows in the passenger windows and storage compartment which block light, you will want Jet Shades installed in these as well as the Jet Shades will block heat, UV, and solar energy making the entire plane much more comfortable while flying. If you have A/C or a portable A/C unit, it will be much more effective, you may even turn it off! The Total Cirrus Solution Jet Shades not only look like they are part of the original aircraft from the inside, but the ramp presence from the outside will turn heads for sure. Check out our videos and detailed product specifications. Start enjoying cool, comfortable flights with one of our Jet Shades Solutions installed in your Cirrus aircraft. Designed with pilots in mind, the Cirrus Cockpit Solution will keep the sun from shining in from above the windshield and reduce glare and eye strain on the pilots, resulting in cooler, more comfortable flights. Jet Shades Cirrus Cockpit Solution also fill the cockpit door windows completely protecting the Pilots from harmful UV Radiation. The Cirrus Windshield Solution is an absolute ‘must have’ for your Cirrus Aircraft. 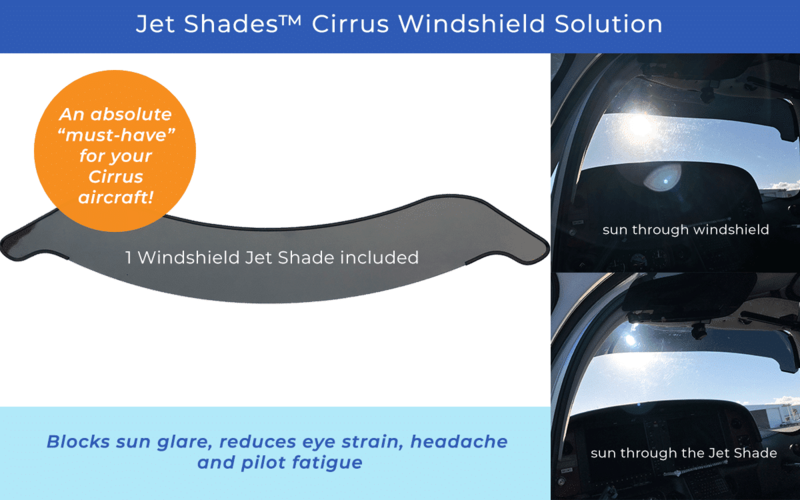 We say this as at Jet Shades we fly a Cirrus and know how difficult it can be with the sun beaming in from above adding glare, eyestrain, headaches, and pilot fatigue to each flight. The upper windshield shade solves this problem by covering roughly the top 7 inches of your Cirrus windshield preventing the sun glare and solar energy from entering into your vision. 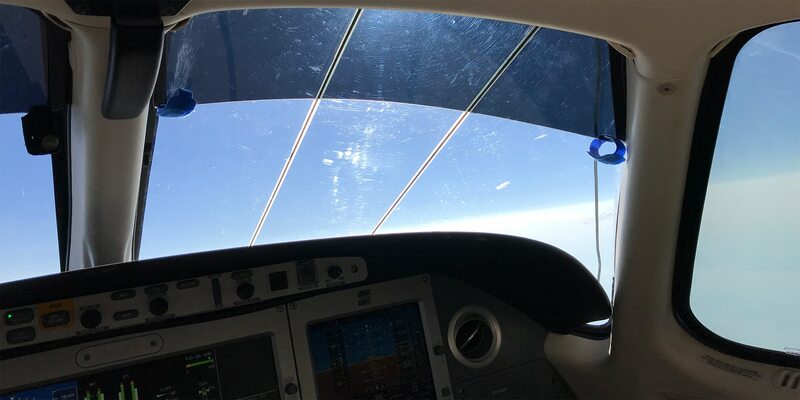 The windshield Jet Shade is a made from our Jet Shades premium material which is an enhanced proprietary blend that provides more protection and reduces additional eye strain on the pilots. This blend is a blue tint on the inside, while a more mirrored look on the outside. While this shade is removable during flight like all of our Jet Shades, we doubt you will remove it as it does not obstruct the view looking out the windshield and still provides great visibility. 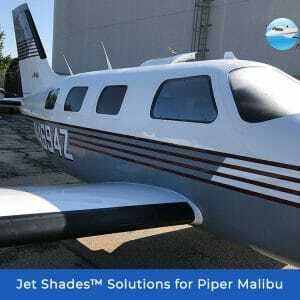 If you only buy one Jet Shade for your Cirrus, this is the one to buy! Reduce storage area temps by 20 degrees or more! The Cirrus Storage Area Solution cools off your Cirrus by preventing heat and solar energy from entering your aircraft through the storage areas. Use during flights and leave on the ground* to not only keep solar energy from out of the storage area, but from sun glaring on your passengers as well keeping them comfortable and allowing them to use there tablets without sun glare. Is your skylight already tinted from the factory? You still will see a significant difference with the Storage Area Solution installed. We have recorded a temperature difference of over 20 Degrees Fahrenheit in the storage area with the Jet Shade installed. 20 Degrees is a lot, especially if you do not have A/C. And if you use a portable A/C device, just blocking the heat and solar energy from the Skylight will impact the performance of your unit. The Cirrus Storage Area Solution Jet Shade is a made from our Jet Shades Premium material which is an enhanced proprietary blend that provides more protection and provides additional cooling for passengers. This blend is a blue tint on the inside, while a more mirrored look on the outside. It also is design to provide additional protection the interior of your storage area from solar damage, as well as protecting the items you place in this area.